In the halls of planning academe, there are few divides as potent as that between the transport folks and everyone else. This is not to say that there is a big love fest between designers, housers, enviros, GIS junkies, economistas, ad nauseum; simply that the gulf between the transport world and everyone else is a tad larger. Perhaps it is their superior numbers - there is still money in transport research, and they have more students - or that the engineering emphasis creates a cultural and methodological divide. UC Berkeley offers an introductory undergrad class in transport - but not in housing, or land use, or community development. Always one to enjoy a good jab, I have never shied away from discussing the divide with friends in the mode choice world - never could I imagine that I would one day become one. Life in the exurbs has changed all that. It is impossible to either live in or write about eastern Contra Costa County without becoming an amateur transportation planner. 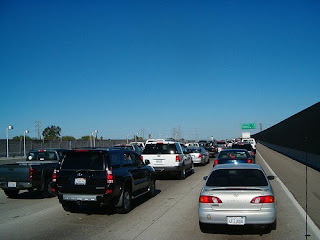 If the default conversation in many places is the weather, in East County, it is traffic. Or more accurately, the various transport projects designed to hopefully dig this metropolitan cul-de-sac, home to a quarter of a million souls, out of some of the worst traffic this side of Bangkok. In classic American style, we allowed the communities of East County to grow exponentially over the course of the past three decades - with the city of Brentwood taking the cake as the fastest growing city in California for a few years back in the boom times of the 1990's - without the transportation infrastructure needed to connect its residents to the job- and education-rich areas on the other side of the hill. They have no BART train, the region's primary attempt at intraregional rail, or even that birthright of the American suburb, a piece of the vaunted Eisenhower interstate highway system. How this happened is a book-length rather than a blog-length story, but the blame surely spreads far and wide, from the halls of Washington and Sacramento to the growth- and massive-truck-loving residents and politicians of the local cities and towns, from regional transportation agencies to Contra Costa power brokers, from exclusionary inner-ring suburbs to greedy developers. It was also not created overnight - the gridlock and isolation of this mini-region wedged between the Bay Area, the Central Valley and the Sacramento delta took two generations to create. Out of this quagmire comes a billion dollar multimodal two-step, a simultaneous freeway widening and BART extension that will double the width of State Route 4 to 8 lanes and add train service down the median strip. At the recent groundbreaking for the Route 4 portion of the project, the only point of contention was whether the project was 30 years too late or 50 years too late. Despite the promise of new trains and less traffic, local residents have not yet broken out the confetti, and not simply because the local economy is so bad that nobody can afford it. There is widespread skepticism that either project will be completed, or completed on time - the current estimates are 2015 for both projects. There is a deep history here - initial BART extension planning called for trains all the way to Brentwood, but the extension fell apart after Union Pacific broke off negotiations, leaving residents with a 10-mile extension that leaves out almost half of the population of the region. Conventional BART (what residents call "real" BART) was deemed too expensive, so rather than the wide gauge electric trains the system is famous for, BART is building eBART, a diesel extension that will require a transfer before getting to the current endpoint of the system at Pittsburg/Bay Point. More importantly, East County residents have been paying property taxes for BART ever since Bay Area residents voted to tax themselves to build it - in 1962. For 47 years, they have waited, as growth turned small industrial towns and even smaller farm towns into an ocean of suburbia for the region's middle and working classes. As the foreclosure crisis and catastrophic declines in property values leave families underwater and cities like Antioch poised on the brink of bankruptcy, the possibility of new transportation infrastructure represents an important beacon of hope. Yet current proposals from BART call for trains which leave too late to get commuters to work and stop too early to integrate residents into the cultural and political life of the region, and which are set to cost more than $2.00 just to get from one end of the extension to the beginning of the regular system. It is unclear whether the current anger is enough to push BART towards better hours and fares, or even whether the decades late and many dollars short investments will be enough to make true mobility possible in East County; but it is certainly enough to turn one curmudgeonly urbanist into a transport guy. Credits: Image of traffic from team pittsburg, image of truck Alex Schafran. Map of eBART from sf.streetsblog.org. Video of eBART from BART on YouTube. And then he became a PhD instead.